Baruna Bay Condo is a Gulf Access waterfront complex consisting of three two story buildings with 28 units. General location is just a short distance west of Skyline Blvd and north above Cape Coral Pkwy. The two buildings at 4708 SW 8th Place were constructed in 1986 and house 16 condo units. The building at 829 SW 47th Terrace was finished in 1987 and has 12 units. All of the units are 2 bedrooms and 2 baths and have the same amount of living area of 1046 sq. ft. The complex includes shuffleboard, a community swimming pool that has a fantastic view down the Baruna Canal. 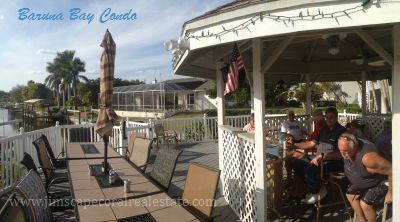 Alongside the pool area is a Tiki Hut Gazebo and a large picnic table for residents to entertain themselves. The complex is lively and on any sunny day you'll usually see people enjoying the pool area, having a cold drink while admiring the long views down the canal. Another feature of the complex is the community boat dock and fishing pier. Great to just walk around on to see what is swimming by, popular area for manatees, and mullet that jump in the air. Individual docks are available on a first come basis, some docks have boat lifts. 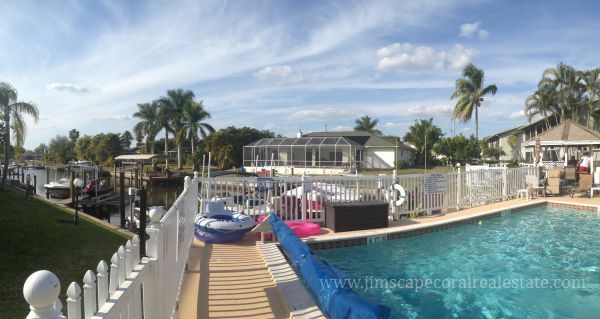 The distance to open water is a little over 3 miles, about a half hour boat cruise that takes you past some of Cape Coral's upscale waterfront homes down near Cape Harbour. Great location to get to main roads to access Fort Myers, supermarkets, shopping and restaurants. A 7-11 opened up in the beginning of 2015 within a short walk of the community. Waterfront living is a wonderful thing to admire and if you're a boater this would be even better!